Coming and going is simple and efficient for everyone in the family when you have mudroom like this! 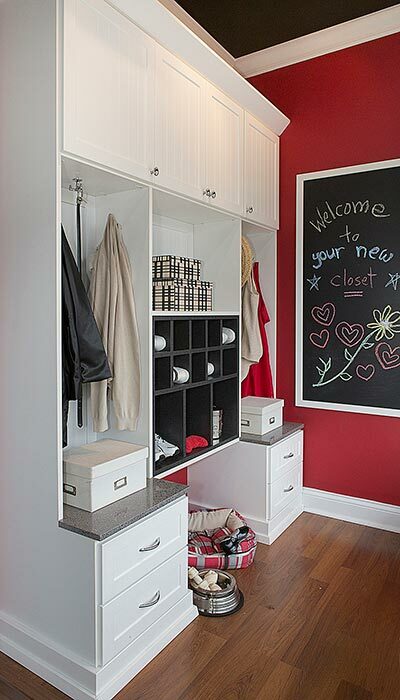 Small but stylish, this mudroom closet is also extremely efficient. Shoes and small items stay organized in the shoe cubby, while jackets and backpacks that get used everyday have hooks to keep them at the ready. Storage cabinets and drawers are included to house the items that are used less frequently while keeping them easily accessible in a pinch. A granite topped bench on either side of the shoe storage offers a convenient place to sit down and put on your shoes before going out. Under the shoe storage is a compartment designed especially for the family dog — even Fido has a special place to organize his bed and bowl. The white, black, gray and red color pallet of the mudroom references modernist Bauhaus design, while the beadboard used on the cabinet doors is a nod towards traditional country decor, making this a transitional piece that could blend well with many homes.